Disk drive service and repair package for those who do not have the knowledge, confidence or desire to open up their disk drive. Just remove the drive from your computer and post to me. The cost of the service is £16.50 + the return postage (added at checkout) and includes full clean, repair, lubrication, belt replacement, head alignment check and testing. Turnaround time is usually within 5 days. If the drive cannot be repaired, then the £16.50 service cost will be fully re-funded. Click the Shopping Cart button and make your payment, then post your drive to my address (on the Contact page). Full instructions for removing the disk drive will be supplied if needed. Please note - I cannot offer this service for drives which are physically damaged, or have had had control board screws removed and lost from previous unsuccessful attempts at repair. 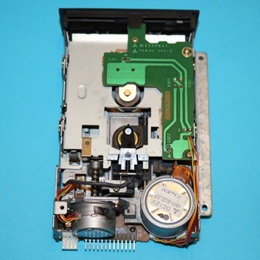 Drives received in this condition will be returned without repair work being attempted. Drives I have repaired have their serial number recorded. I have had several occasions where drives I have successfully repaired and tested have been rejected as non working on their return, then different non working drives sent back to me for repair under "warranty".